Palmeiras were so much closer to 0-3 than 1-2 against Santo André, but that’s football. The Verdão was brutally superior and Valdivia, outstanding; a truly spectacular player to watch. Kleber was the same warrior as always and, on top of things, got lucky. He burnt two penalties and could have turned into the villain, hadn’t he immediately converted the situations into goals. Kleber is simply put “raçudo”, someone who never gives up. Not only Valdivia and Kleber but all players performed well. Still, there was something missing in the collective aspect. Felipão was obviously not pleased with what he saw on the pitch and the players were perhaps taking it a bit easy, relaxing, enjoying themselves too much. Concentration is a tricky thing and nothing you snap on and off at will. Result: with only a few minutes left of the game, Santo André scored. For the first time in five games, Deola had to scoop a ball out from the net. No catastrophe by any means, but unnecessary; it would of course had been better with a 0-2 advantage going into the home game next week. Anyway: highlights for your viewing pleasure below. On Sunday, Palmeiras’ opponent is Ponte Preta – it’s the last round of the Paulistão before the knockout phase. 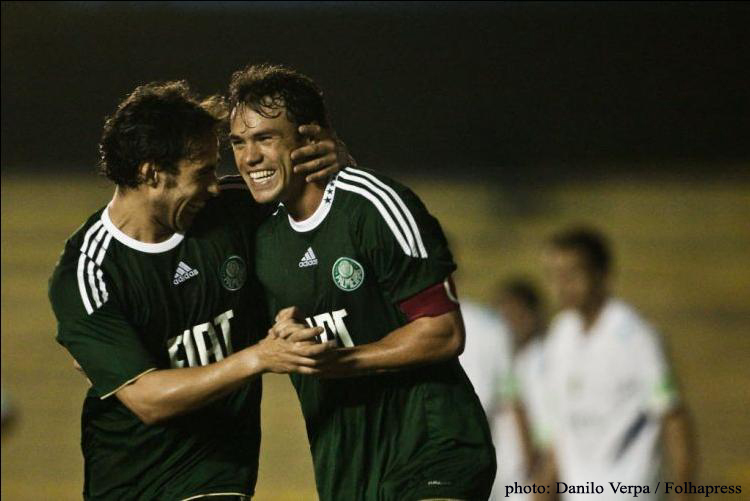 A win and Palmeiras secure first position. It would be good but not crucial; the fact that Scolari is signalling that he might let some key players get a bit of rest indicate that he thinks the same way. The squad will be defined after players have been through a battery of medical and physical exams that will take place in the next couple of days. Next The stage is set! Testing, for the first time, access from an iPhone. Looks good! Time for our team to show it is true colors. The first 19 games of the Paulista were great to prepare us to the Playoffs (mata-mata), and we were able to achieve a consistant game that enable Verdao to play and beat ANY team. NOW, the team must reach deep and show it is true colors and WIN baby. Just win baby!! The schedule is in our favor since we play two games this week (return leg vs Santo Andre on Thurday and the Quarterfinals vs Mirassol). Then we will have one week to prepare for Corinthians most likely next week. After that, 4 weeks of great two great matches per week as we keep winning in Copa do Brasil and start the Brasileirao. I agree on every single point, Abraham! The time to shine has come!